Come on folks, admit it! 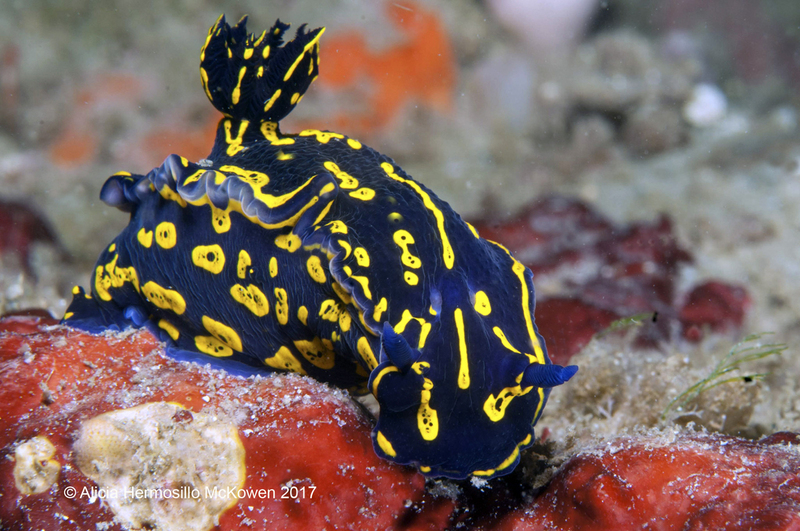 Nudibranch afficanados have a lot in common with baseball card collectors! As we progress in our study of our friends the sea slugs, we are never satisfied with the status quo! We just have to travel to the far ends of the earth to see and photograph the all consuming "Holy Grails" of the slug world. For me Melibe Colemani was at the top of the list for sometime, but I have been able to video it in the last couple of years and even find it on my own! Ok, so who moves to the head of the list with M. colemani a done deal?? Easy decision for me and I don't have to book a trip to the far off Pacific to see it! This story begins back in 2005, when I attended a nudibranch workshop in Cerbere, France in 2005. First time for diving the Med and first time to see Hypselodoris picta (yellow version) as it was known then! What a regal beast! I just couldn't take enough pictures of it. It was indelibly imprinted in my mind for a revisit, especially when I first saw Carol Cox's pics of its blue colored cousin residing in the Western Atlantic region! More recently, Ali Hermosillo McKowen has posted magnificent pics on F. picta taken off Destin, Florida! That set in motion a quest to finally see and video this slug! Out went the travel options to the Philippines and beyond and out came domestic air schedules to destinations in Florida where we might be introduced (The slug and I)! Sounds crazy I know, but you diehard sluggers will understand! 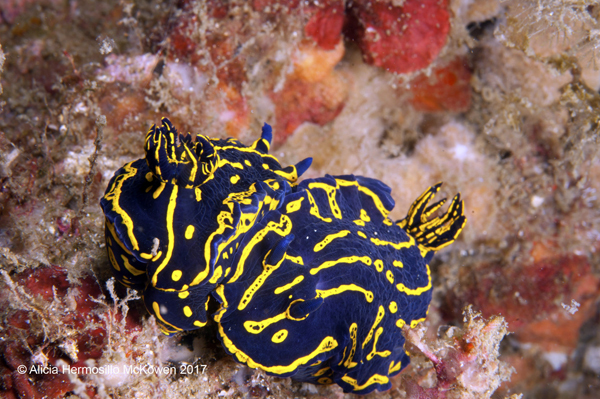 For a comprehensive taxonomy review on F. picta , the reader is invited to visit Bill Rudman's Sea Slug Forum. Ali Hermosillo probably needs no introduction to readers of this site. She is one of our more prolific contributors going back many years. 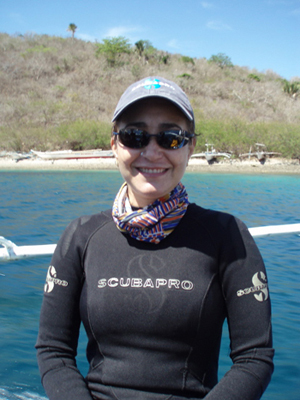 She is also one of our most knowledgeable experts and is so keen on discovering all the secrets of our sea slug friends, that she went through all the trouble to acquire a Doctorate to set the stage for a lifetime learning process. She also collaborated with Dave Behrens in publishing Eastern Pacific Nudibranchs . Well, the superlatives could roll on and on! Think you get the picture! I highly recommend diving with her if you ever get the chance, but be aware that your interest and energy level must match hers or all you'll ever see is her wake below the water! 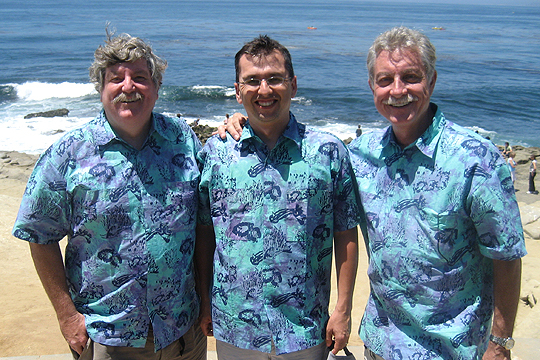 From left to right, Terry Gosliner, Angel Valdes, Dave Behrens La Jolla, Calif.
© The Slug Site, Michael D. Miller 2017. All Rights Reserved.